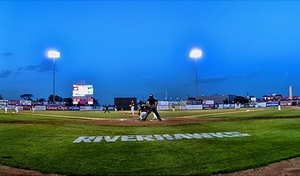 08/23/2012 10:27 AM - LOVES PARK, Ill. - The Frontier League has added three games to the RiverHawks' schedule that will be played August 28-30 between the RiverHawks and the Road Warriors. 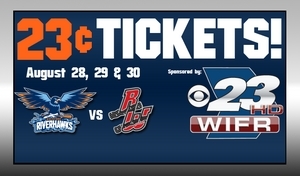 Thanks to WIFR, all tickets will be just 23 cents! LOVES PARK, Ill. – Michael Hur’s record-tying home run Monday helped the Rockford RiverHawks avoid a series sweep in a 5-4 win over the Schaumburg Boomers. 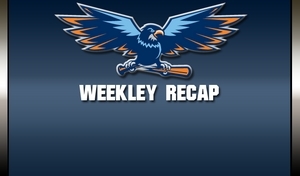 LOVES PARK, Ill. – The Rockford RiverHawks dropped their first five games of their final homestand of the season, a stretch of nine games in 10 days. 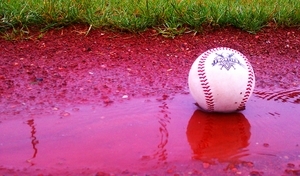 08/26/2012 3:35 PM - LOVES PARK, Ill. - Sunday's game vs Schaumburg has been postponed. It will be made up Monday, August 26, starting at 6:05 p.m. Any ticket for tonight's game can be exchanged for any remaining RiverHawks home game. Tickets must be exchanged at the box office. LOVES PARK, Ill. – The Schaumburg Boomers launched five home runs Saturday in a 15-1 win over the Rockford RiverHawks in front of a sellout crowd of 4,167 at RiverHawks Stadium. Final weekend home games full of fun!